Walk into any yoga studio in the west, and you're likely to find one or more of the following items: a Ganesh figure or banner; a Shiva sculpture in "nataraj" pose; an "OM" symbol in Sanskrit - and this one could be on student scarves, yoga mat bags, shirts, banners, a candle or anything else that you can imagine. Many of these symbols we learn about in yoga class or teacher training and hold sacred as a special symbols of "yoganess" like a secret handshake or uniform of a private club. But most of us only see these symbols when we're in our private meetings, i.e., a yoga class or workshop with other members of our club. Occasionally, we'll pass another on the street and smile when we see another member of our club wearing one of these sacred symbols. My personal favorite club symbol is Ganesh. 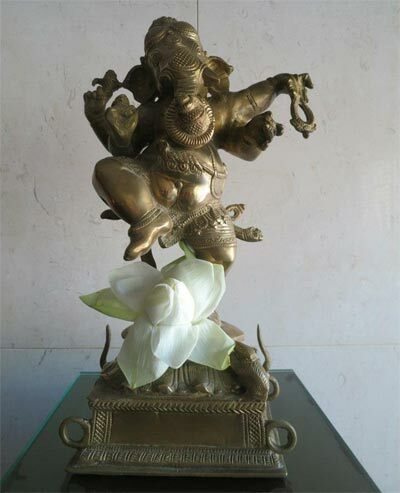 He's the god of good luck, new ventures and overcoming obstacles. I carry a figurine in my purse, keep an image of him on my iPhone screen, and have a few figurines on my desk near my computer. So, imagine my delight when my husband and I arrived in India and our guide greeted us with a special gift - a small sculpture of Ganesh. A perfect gift for a new journey, luck and getting through obstacles (like the crazy traffic in India). Looking back on my travels in India, I realize how smoothly and flawlessly everything went - in a country that I describe as "organized chaos" - perhaps with a little help from my Ganesh? Or was it from the 12,000 other Ganesh statues that I gazed on in hotels, restaurants, entry ways to museums, car windows and dashboards, highway billboards, clothing, Hindu temples and, of course, handicraft shops. And, yes, I smiled and pointed at each one I saw...every 5 seconds. So, by day 3, Ganesh was a ubiquitous symbol - along with the rest of our club's symbols. But while I was in the process of being desensitized to feeling warm and fuzzy by seeing it too often, I noticed that it didn't at all hinder the true worshipers from loving and honoring his image - including the hotel staff that made a little puja with flowers around my Ganesh. In fact, there were always flowers or burning incense surrounding every Ganesh statue all over India. Perhaps it's because Ganesh represents more about the Indian culture than my own culture. To understand, or maybe for some visitors to tolerate, India, it's important to see what might be in front of you without judgement - cows moving freely through the streets, unorganized traffic patterns, women and children begging in the streets, and palaces and poverty existing next to each other, seemingly without one trying to change the other. Perhaps it's Ganesh that creates faith for some to move beyond the obstacles, removing doubts and reminding everyone who passes to see the opportunity to start again each day with new, positive intentions, despite previous obstacles. It is said that Ganesh's funny looking form - an elephant head and human body - completely goes beyond the rational thinking mind and forces you to look beyond appearances. Is could almost describe the way to understand India. Seeing past what we can't comprehend visually or mentally, to what we can comprehend spiritually is the challenge in the great nation of India - whether you're Hindu or not. As yoga practitioners, we experience this each time we're challenged with a new pose. It may look crazy or impossible, but once we learn how to process it through balance and alignment or muscle memory, we are able to break through the obstacles of what we thought we couldn't do and one day find ourselves in the pose. So while our Ganesh, Shiva and OM symbol may unite yogis of the west to remember the challenges of our practice, and the ones we face off the mat, I learned that these symbols are ubiquitous in breaking through barriers of language and religion to unite millions of Indians in a country that faces challenges everyday that most can't even begin to comprehend.